Milling cutting means your opened mail has safe, soft-feathered edges, while preventing damage to envelope contents. The enhanced sorter option (Model 306s) adds the ability to separate opened mail into two different output paths based on programmable length, width and/or thickness. This lets you group “clean” and “exception” mail before distributing to recipients. The 306s is the world’s fastest envelope opener/sorter, making it the appropriate automation solution for mail centers with large volumes of inbound mail. High Speed for High-Volume Incoming Mail: The 306 blasts through envelopes so fast, you may have trouble keeping the feeder full. At up to 40,000 envelopes/hour, this satisfies the needs of most large volume mail centers. Advanced Cutting Technology: The milling cutter has eight cut-depth positions, and is able to cut to depths as small as 1/10 inch, preventing damage to envelope contents. The cutter makes soft, feathered edges on the envelope openings, which guards against paper cuts, and generates waste as tiny paper chips. 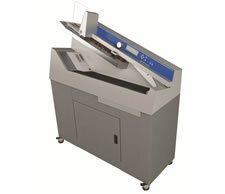 It includes a “no-cut” position for envelope counting modes. Control Panel: The 306 comes with a user-friendly control panel and sharp LCD display with integrated software that makes setting flexible job criteria easy. It supports multiple users with password security. Retractable, Ergonomic Mail Tray Holders: Operators will appreciate the integrated slide-out mail tray holders that position input and output bins right where they’re needed.